Noether proved lots of theorems, but when people talk about Noether’s theorem, they always seem to mean her result linking symmetries to conserved quantities. Her original result applied to classical mechanics, but today we’d like to present a version that applies to ‘stochastic mechanics’—or in other words, Markov processes. 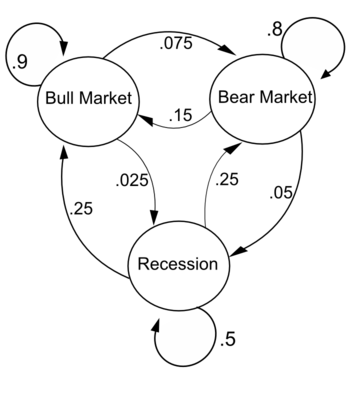 What’s a Markov process? We’ll say more in a minute—but in plain English, it’s a physical system where something hops around randomly from state to state, where its probability of hopping anywhere depends only on where it is now, not its past history. Markov processes include, as a special case, the stochastic Petri nets we’ve been talking about. Our stochastic version of Noether’s theorem is copied after a well-known quantum version. It’s yet another example of how we can exploit the analogy between stochastic mechanics and quantum mechanics. But for now we’ll just present the stochastic version. Next time we’ll compare it to the quantum one. We should and probably will be more general, but let’s start by considering a finite set of states, say To describe a Markov process we then need a matrix of real numbers The idea is this: suppose right now our system is in the state . Then the probability of being in some state changes as time goes by—and is defined to be the time derivative of this probability right now. That makes sense: the probability of being in the state $i$, which starts at 1, can’t go up, at least initially. If is an infinitesimal stochastic operator, we will call a Markov process, and its Hamiltonian. Noether’s theorem is about ‘conserved quantities’, that is, observables whose expected values don’t change with time. To understand this theorem, you need to know a bit about observables. In stochastic mechanics an observable is simply a function assigning a number to each state . for any function on . The reason is that later, when we generalize from a finite set to a measure space, the sum at right will become an integral over . Indeed, a sum is just a special sort of integral! which is even simpler. But the commutator will become useful when we get to Noether’s theorem! for all obeying the master equation. If you know Noether’s theorem from quantum mechanics, you might be surprised that in this version we need not only the observable but also its square to have an unchanging expected value! We’ll explain this, but first let’s prove the theorem. We wish to show that . To show this is zero for each pair of elements , it suffices to show that when , then . That is, we need to show that if the system can move from state to state , then the observable takes the same value on these two states. Why? When , , so that term in the sum vanishes. But when , and are both non-negative—the latter because is infinitesimal stochastic. So if they sum to zero, they must each be individually zero. Thus for all , we have . But this means that either or , which is what we need to show. So that’s the proof… but why do we need both and its square to have an expected value that doesn’t change with time to conclude ? There’s an easy counterexample if we leave out the condition involving . However, the underlying idea is clearer if we work with Markov chains instead of Markov processes. The idea is that describes a random hop, with being the probability of hopping to the state if you start at the state . These probabilities are nonnegative and sum to 1. Any stochastic operator gives rise to a Markov chain And in case it’s not clear, that’s how we’re defining a Markov chain: the sequence of powers of a stochastic operator. There are other definitions, but they’re equivalent. In other words, an observable commutes with iff the expected values of that observable and its square don’t change when we evolve our state one time step using . Puzzle. Prove Noether’s theorem for Markov chains. for all . The reason, in plain English, is this. Nothing at all happens if you start at states 0 or 2: you just sit there, so the expected value of doesn’t change. If you start at state 1, the observable equals 1. You then have a 50% chance of going to a state where the observable equals 0 and a 50% chance of going to a state where it equals 2, so its expected value doesn’t change: it still equals 1. After all, if you start at state 1, equals 1 there. You then have a 50% chance of going to a state where equals 0 and a 50% chance of going to a state where it equals 4, so its expected value changes! So, that’s why for all is not enough to guarantee . The same sort of counterexample works for Markov processes, too. for all smooth and all obeying the master equation. These make the ‘forward direction’ of Noether’s theorem stronger… and in fact, the forward direction, while easier, is probably more useful! However, if we ever use Noether’s theorem in the ‘reverse direction’, it might be easier to check a condition involving only and its square. This entry was posted on Tuesday, October 4th, 2011 at 6:24 am and is filed under mathematics, networks, physics. You can follow any responses to this entry through the RSS 2.0 feed. You can leave a response, or trackback from your own site. Thanks, but no: I think you’re mixing up ‘infinitesimal stochastic’ and ‘stochastic’: see Part 5 for both those concepts. is infinitesimal stochastic iff is stochastic for all . It’s a bit like self-adjoint versus unitary. 1) “the number describes the probability per unit time of hopping from the state to the state ” is not quite correct. is the rate at which the system hops from state to state . In other words, for an infinitesimal time the probability for jumping is . The difference between the two is similar to the difference between the interest rate and the AER (annual equivalent rate, for non-UK readers). 2) “Together, they imply that the probability of staying in the same place goes down: .” is not clear to me. What is this “probability of staying in the same place” and it is going down as what changes? I think it would be clearer to say that is the rate at which a system in state leaves that state. 3) “we call a Markov process”. The term “Markov process” already has a different well-defined mathematical meaning. The group of operators is often referred to as the “Markov semigroup”. I am happy with the term “Hamiltonian” for the generator of this semigroup. In principle I like the approach taken here of giving physicists’s quantum mechanical names to probability theory concepts. It makes the theory more accessible to physicists. In that vein I would go even further and use Dirac’s bra-ket notation rather than the integral notation you employ. So, for example, instead of I would write where satisfies . I think the integral notation is unsatisfying to both mathematicians and physicists (physicists will be wondering where the dx went and mathematicians will want to know what measure is used). “the number describes the probability per unit time of hopping from the state j to the state i” is not quite correct. is the rate at which the system hops from state j to state i. In other words, for an infinitesimal time the probability for jumping is . This issue comes up over and over when I write about these things. I feel I have trouble explaining this concept both accurately and very quickly. I completely understand the problem with what I said: it might seem like the probability that the system hops from state j to state i in, say, one second. As you know, what I really mean is to take the probability that the system hopes from state j to state i in seconds, divide it by , and then take the limit as . But that takes a while to say! I’m always afraid that calling this quantity “the rate at which the system hops from state j to state i” will confuse people, because this description doesn’t mention probabilities. This rate is a “probabilistic rate”, and the phrase “probabilistic rate” is not part of everyday English. I guess say things like “on average, a bus comes by every 10 minutes”. But if you say “the rate at which buses come by is 1 per hour”, I bet they won’t guess you mean a probabilistic rate. What do people think is clearest? This time I’ll add a lengthy precise description, but I don’t want to always have to give such a long description. I want a clear short description that nonexperts can understand. John, this discussion has been very instructive for me. It opened my eyes to the problems one runs in to when one wants to be precise and colloquial at the same time. In particular this is difficult if one wants a blog post to be readable to someone who has not read the previous blog posts in the series. I would vote for “probabilistic rate”. You are right that this is not part of everyday English. Therefore I suspect it also does not carry any misleading connotations. Most readers will probably just swallow it and the curious ones will be tempted to read your earlier posts with the precise explanations. Initially I had felt that “stochastic rate” might work, but I now realise that the word “stochastic” might sound technical. One of my books on probability uses “probability intensity of transition from state i to state j”. What you call the Hamiltonian I would call a “rate matrix”, or an “instantaneous rate matrix” if I thought the former was likely to confuse. “Probability intensity” is an interesting phrase. I’m not sure most people would instantly understand it, but they could learn. and this indeed has advantages. But I thought that sticking a minus sign would seem peculiar to beginners. “Together, they imply that the probability of staying in the same place goes down: .” is not clear to me. What is this “probability of staying in the same place” and it is going down as what changes? These comments are really useful, because while you and I both know what I really meant to say, I plan to turn these posts into a paper or book someday, and then it’s important that they be clear. But again, the problem comes when I try to say this very quickly and informally but still clearly. I think it would be clearer to say that is the rate at which a system in state i leaves that state. Again, I avoided saying this because this rate is a “probabilistic rate”, a rate of change of probabilities, and what you say here doesn’t make that clear. “The rate at which the probability of staying in the state diminishes” is perhaps more precise—but it sounds stilted, not conversational. But I’d like a way to say this that’s quick, informal, yet clear. Of course I need to explain this idea clearly and patiently somewhere. But then there will be times I need to remind people of it—and those reminders should be terse but not misleading. Thank you John, that was helpful. While reading that sentence that gave me difficulties I had not realised that the probability you were talking about was given as a simple exponential and therefore I had not made the connection between the decrease in that probability and the sign of . I know I am in a pedantic mood. But I think being pedantic is fun. So here I go again. There is a difference between two probabilities. gives the probability of _being_ in state at time given that we start in state at time . The probability of staying (in the sense of never leaving) in state until at least time is . Luckily they both have the same derivative at , so they both go down at . The probability of staying has the added benefit of going down also at . The probability of being in the state on the other hand could conceivably go up again later. So it is good that you chose to talk of the probability of staying. “we call a Markov process”. The term “Markov process” already has a different well-defined mathematical meaning. The group of operators is often referred to as the “Markov semigroup”. Hmm, when I read the definition of Markov process, it sounds like a long-winded way of describing a Markov semigroup. Isn’t there a one-to-one correspondence between Markov processes and Markov semigroups? If there is, I can just insert a little note saying that I’m abusing language a bit. I am happy with the term “Hamiltonian” for the generator of this semigroup. Good, because I want you to be happy, and that’s what I’m going to use. I would go even further and use Dirac’s bra-ket notation rather than the integral notation you employ. Probabilities and amplitudes are similar yet strangely different. Of course given an amplitude we can get a probability by taking its absolute value and squaring it. This is a vital bridge from quantum theory to probability theory. Today, however, I don’t want to focus on the bridges, but rather the parallels between these theories. In probability theory, we integrate over a set to find out the probability that our systems state is in this set. In quantum theory we integrate over the set to answer the same question. In short, integrals are more general than sums! So, I’ll mainly talk about integrals, until the very end. You may wonder why I defined to consist of complex functions when probability distributions are real. I’m just struggling to make the analogy seem as strong as possible. In fact probability distributions are not just real but nonnegative. We need to say this somewhere… but we can, if we like, start by saying they’re complex-valued functions, but then whisper that they must in fact be nonnegative (and thus real). It’s not the most elegant solution, but that’s what I’ll do for now. First came probability theory with ; then came quantum theory with . Naive extrapolation would say it’s about time for someone to invent an even more bizarre theory of reality based on In this, you’d have to integrate the product of three wavefunctions to get a number! The math of Lp spaces is already well-developed, so give it a try if you want. I’ll stick to and today. This heightens the resemblance to Dirac’s bracket notation: quantum mechanics uses for the expected value of an observable, while stochastic mechanics uses . However, I’m sure that writing for the expected value of an observable in the state would annoy lots of people. For one thing, lots of people use , sweeping under the carpet. This is sort of stupid, but it’s completely entrenched. So, for now I’m using instead. And this has the advantage of having a fairly self-evident meaning: I’m integrating the function over the space . The proof of Noether’s theorem is neat, but I wonder if it can be cleaned up? For example, is there a way to prove it without resorting to components? Good point! Someone try it! John, I am not yet sure why you do not like the notation . I am using it simply in the spirit of Dirac, who wasn’t worrying about mathematical subtleties like whether wavefunctions live in or . I guess, in the language of spaces I would have to say that the kets live in and the bras in , but for the purpose of these blog posts we can follow Dirac and ignore such details. Everyone has their own notation and nobody likes anyone else’s. I take that for granted as a condition of life. I don’t want to know why other people hate my notation; I don’t expect them to care why I hate theirs. I prefer to discuss more interesting things. So, this comment will be somewhat grumpy in tone. I am trying to clarify and exploit the logical relation between probability theory and quantum theory. This involves noting the similarities but also respecting the differences. I am not at all interested in ‘following the spirit of Dirac’, if that means ‘glossing over mathematical subtleties’. However, I don’t want to scare my readers by introducing too much formalism too soon—especially if I haven’t worked out the details! So far in this series of posts, I’m pursuing the philosophy that quantum theory is about Hilbert spaces while probability theory is about vector spaces equipped with some other structure. This extra structure is something like that of an integration algebra… but that may not be quite right, so I’d rather not talk about it yet. So, instead, I’m saying that quantum theory is about while probability theory is about . This is easier for everyone to understand. Given this, I want to write the integral of the function as , rather than trying to artificially force probability theory into looking like quantum theory by writing it as . There is a certain quaint charm in using an integral sign to denote integration, after all. But if someone held a gun to my head and forced me to use Dirac notation here, I would write , which at least makes some sense: as you note, we can say we’re pairing the element with the element . But if we try to understand the relation between quantum theory and probability theory this way, I believe we’ll get quite confused. Anyway, there are lots of interesting issues to discuss here, but I think it will be easiest if we decouple them from the question of what notation to use. A lot of people do this — it’s the first way I’d seen the technology set up, though of course that doesn’t mean it’s the best or the most illuminating choice. We can get a stochastic state from a quantum state by forming : we all learn about this in school, when people discuss the probability interpretation of the wavefunction. Conversely (though I never hear anyone talk about this) we can get a quantum state from a stochastic state by forming . But in the approach where we talk about , it seems we are simply pretending a stochastic state is a quantum state, while neglecting all the problems this raises! Believe me, I’d be fascinated if someone could tell a coherent story about this… I’m not trying to nip an nascent idea in the bud… but so far all my thoughts about this suggest it’s a wrong road. More seriously, I think the main issue is that most of the people involved just weren’t that concerned with quantum-to-classical transitions. If the smallest thing you’re considering is a rabbit, a sand grain or even a clump of cells in a human neocortex, going from a probability distribution to a quantum density matrix or vice versa isn’t a top priority. So, while being able to lift tools out of the quantum toolbox is nice, relating a stochastic description of a system to a quantum description of the same physical system isn’t a goal. since the state is a left eigenstate of all the , with unit eigenvalue. Second, I think that the people who study diffusion-limited reactions, active-to-absorbing phase transitions, directed percolation and the like are generally eager to skip past the first steps of defining the formalism and get to a Lagrangian they can play with. A better notation at the beginning may obviate the need for a few awkwardnesses further along (e.g., field redefinitions); I’ll have to look into that. The stuff they seem to spend the most time worrying over comes after they’ve a stochastic Hamiltonian in the coherent-state representation: renormalization, estimating critical exponents, etc. Does it still count as a “nascent idea” if it’s been around since 1976? I’d say the mathematical trick has been around since 1976. The nascent idea lurking in this trick is that we can think of a probability distribution as a quantum state if we normalize it in a nonstandard way and promise to only ask about its transition amplitudes to a certain ‘default’ state . Mathematical tricks often conceal ideas that are too strange for people to say in words. More seriously, I think the main issue is that most of the people involved just weren’t that concerned with quantum-to-classical transitions. Yes, that’s one part of it. But even if we don’t try to describe the same system both classically and quantumly, there’s also the question of the logical relation between the classical and quantum descriptions: that’s what I’m especially interested in. But this is not the sort of question that ‘practical’ people tend to enjoy—perhaps because they can’t imagine what one might do with the answer. Second, I think that the people who study diffusion-limited reactions, active-to-absorbing phase transitions, directed percolation and the like are generally eager to skip past the first steps of defining the formalism and get to a Lagrangian they can play with. Right. For me the murky beginning steps are the most interesting part, because they hint at a relation between quantum mechanics and probability theory that seems a bit different than the ‘obvious’ one, where rather than the wavefunction acts like a probability distribution. I’ve got a bunch of ideas about this that I’ll reveal as soon as I can. This is a really annoying bug! I use Firefox 7.0.1 and see the first version. With Google chrome and IE, what I see is mathematically correct, but very messy. The slash through the equals sign is too far to the right, and the arrow is made of an equals sign and and arrow which don’t line up. That’s what I used to get, back when things worked for me. I thought that was bad… but I don’t mind an ugly sign nearly as much as one that looks exactly like ! By the way, I don’t know why your 3 attempts to post this ran into trouble. I get the first too, although it’s not nicely rendered. I’m using Firefox 7.0. Thanks, guys! Does anyone see the &ne; as an equal sign? I now think it could be because on this computer I’ve downloaded fonts so that jsmath doesn’t need to grab them from somewhere else. I assume you guys are getting the little message on top, about jsmath? It looks fine to me (Firefox 3.6.22). The “not equals” sign is perfect. There’s a slight wobble in the shaft of the “implies” sign are slightly misaligned, but I’d hardly have noticed. Oops, there was a wobble in my English composition there, too. But I think you know what I mean. Opera 10.0, which is notorious for getting maths wrong. It shows an extra ‘=’ prepended to the => sign (is this to make a long implication arrow?) In Opera itself the ‘=’ is at a slight angle but when I did a screen grab it came out straight, except that you can see the join, so I have some kind of optical illusion as well. Anyhow, I am wondering if the extra ‘=’ is being moved around somehow. the arrow is made of an equals sign and and arrow which don’t line up. There’s a slight wobble in that the shaft of the “implies” sign is slightly misaligned, but I’d hardly have noticed. I think you’re all describing the same thing, which I’m also seeing on my laptop at home. I think that’s because I risked a \Longrightarrow instead of a mere \Rightarrow. Luckily, none of you see the ≠ coming out as an =, and neither do I, here at home. Only my computer at work commits that heinous crime! Over on the Forum, Eric Forgy came up with a relative of Noether’s theorem that goes like this. so obeys the master equation. Proposition: if obeys the master equation, then iff obeys the master equation. Eric Forgy also lured me into thinking about the Schrödinger versus Heisenberg pictures in stochastic mechanics. for both positive and negative times. where the second step uses the remarks I made earlier. There’s more to say, but not now! It’s dinnertime! Another option is to let evolve as an operator. I’m writing some notes on that idea on the forum as we speak. So, if I understand well, if the graph is connected, observable O will take the same value on all of the states. Otherwise, it will have different constant values in each component (but I do not consider disconnected graphs as really interesting, as each component is completely independent of another: each process happens on its own). “If a time-independent observable’s average and variance do not vary in time, then the observable is uniform of the vertex set”. – I wonder if this could have anyhing to do with Discrete Analytic Functions (http://www.cs.elte.hu/~lovasz/analytic.pdf), which are constant on any compact discretized Riemann surface. – The fact that first and second moments play the crucial role for Markov processes resounds with the continuous variable case, where the underlying stochastic processes have at each time gaussian distributions – the gaussian has only first and second nonvanishing moments – and something similar happens in Pawula’s theorem for the truncation of the Kramers-Moyal expansion after the second term. That’s right. By the way, for people who don’t understand what you said, let me add that you’re taking the points of our set as the vertices of a directed graph, and drawing an edge from to whenever is nonzero. (but I do not consider disconnected graphs as really interesting, as each component is completely independent of another: each process happens on its own). Well, you may not consider it interesting, but that’s what a conserved quantity does: it splits the set into a disjoint union of subsets on which takes different constant values, and our Markov process then becomes a ‘disjoint union’ of Markov processes on these subsets. It’s exactly like in quantum mechanics, where a conserved quantity splits the Hilbert space up as a direct sum of eigenspaces, and time evolution separately preserves each eigenspace. the total number of particles of types 1 and 2 is conserved. This explains how from a single Poisson equilibrium state we were able to extract a lot of different equilibrium states in which that number took different values. I’ll work out this example in detail sometime, for people who need a bit of help. OK, I buy it. But still I prefer the formulation “If a time-independent observable’s average and variance do not vary in time, then the observable is uniform over the vertex set (of a connected graph)”. I think it does have something deep in it related to the key role of the first and second moment for stochastic processes. On the Schrödinger/Heisenberg picture: I’ve seen people using a sort of “interaction picture”, where the hamiltonian is split in the waiting time contribution and an interaction hamiltonian and then take care of these two pieces when exponentiating . It’s very useful for guessing the correct path measure, for example. I myself had a complete discussion of this procedure on my master thesis, but it is in italian. However, I’ve never seen it discussed in relation to the evolution of a conjugate observable . It would be interesting to see what happens if one discharges part of the evolution (the “free” one) on an observable and part (the “interacting”) on the probability measure itself. Maybe it would make calculations easier. This is different than the interaction picture in quantum mechanics, where by itself is already self-adjoint, so that the free evolution is unitary between the ‘jumps’. I’ve always been here – but with too little time for discussion. Oh, good! Sometimes I think everyone is leaving, or falling asleep. This is precisely what I had in mind. I can send you via email a couple of pages from my master thesis if you want: they are in Italian, but the formulas are quite clear. If it mainly says what we’ve already discussed, I guess I won’t make you bother. I guess this is some sort of ‘folk wisdom’. Since nobody did the puzzle this time, I’ll have to do it myself. where in the last step we use the fact that is stochastic. To show this is always zero, we’ll show that when , then . 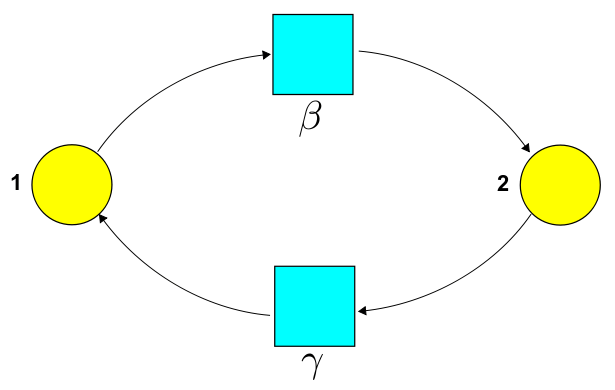 This says that when our system can hop from one state to another, the observable must take the same value on these two states. Why? The matrix elements are nonnegative since is stochastic. Thus the sum can only vanish if each term vanishes, meaning that whenever . Word spreads fast! Here’s an announcement of a talk at the Oxford OASIS series. That stands for Oxford Advanced Seminar on Informatic Structures. For this week’s OASIS seminar we have the pleasure of a talk by Harvey Brown, the professor in philosophy of physics at Oxford who is well-known for his work on the foundations of quantum mechanics, relativity theory, and the role of symmetry principles in physics, including several books. Moreover, he is a very clear and entertaining speaker! This Friday he will convince us that we need to take symmetries and their subtleties more seriously. Time and place: This Friday, 2pm, Lecture Theatre B, Department of Computer Science. Title: Noether’s famous 1918 symmetry theorem — what does it prove? Abstract: Recently, Brendan Fong and John Baez have provided an analogue in stochastic mechanics to what they call Noether’s theorem in quantum mechanics. Noether’s original theorem, relating symmetries and conservation principles, was the first in a series of theorems she proved in 1918 within a program in the calculus of variations, inspired by interpretational problems related to conservations laws in general relativity. I will sketch the background to Noether’s work and give special emphasis to the form and meaning of her “first” theorem. An unusual application of the theorem to quantum mechanics will be exploited. Philosophers of physics being as they are, the phrase “what they call” makes me afraid he’s planning to chide me for using the term “Noether’s theorem” in a very extended sense, not very close to that of her original 1918 paper. Physicists being as they are, such chiding wouldn’t stop me. But I’m curious to hear what he actually says. The talk will be videotaped and put on the OASIS website. Furthermore, Brendan is now at Oxford and can hear the talk in person! Very cool. I look forward to seeing that. In the 2 theorems at the end, why is , when f takes and gives only expressions in O ? Also, When we have f(O), does f being smooth mean that, it can be expanded in the form of a power series in O? The functional calculus allows you to apply any function to any self-adjoint matrix (and thus any self-adjoint operator on a finite-dimensional Hilbert space), or any holomorphic function to any matrix (and thus to any linear operator on a finite-dimensional space). converges for all matrices , so we can define to be this. We need to be self-adjoint here because that guarantees that we can choose a basis of eigenvectors of . For some reason I chose to focus on the case where is smooth, but there was no need to do this. Since is self-adjoint, I could have assumed is any function whatsoever.